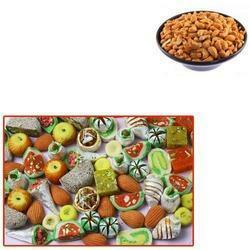 Offering you a complete choice of products which include roasted cashew for sweets. With our immense domain expertise, we are engaged in offering a broad range of Roasted Cashew for Sweets. The offered roasted cashew is roasted & hygienically processed using advance equipments. Our provided roasted cashew contains various health benefits and is free from any kind of harmful preservatives. As well, we offer this roasted cashew in variegated packaging options with bulk order. Looking for Roasted Cashew for Sweets ?